What makes our dealership stand out in the “The Heart of the Wheat Belt”? We have the largest selection of Chrysler, Dodge, Jeep & Ram vehicles in Saskatchewan, and our dealership is just a short drive from Saskatoon in Rosetown. Our finance department will work hard to find you the best low rates and loan packages possible. Mainline Chrysler has a strong and committed sales staff with many years of experience satisfying our customers’ needs. We invite you to browse our massive inventory online, or better yet, visit us in person at 505 Hwy #7 West in Rosetown, SK. 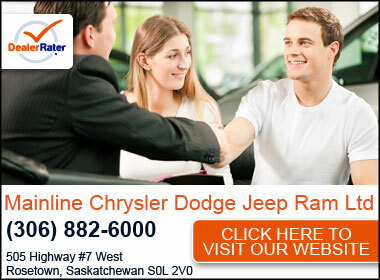 With such a large inventory, we are one of the few Chrysler Dodge Jeep dealerships working with people from all over the greater Saskatoon region.